On January 9, 2009, the Sudanese partners to peace, the Sudan People’s Liberation Movement (SPLM) and the National Congress Party (NCP) and other Sudanese political organisations gathered in the town of Malakal, the capital of the Upper Nile State, to commemorate the fourth anniversary of the signing of the Comprehensive Peace Agreement (CPA), which took place in Kenya on January 9, 2005. While in Malakal, the Sudanese leaders tried to share their achievements and shortcomings with the Sudanese and looked into the future as they march towards the last two years of the interim period. In January 2006, I wrote a piece entitled “Five Years to go to Referendum”. I dealt with different aspects of the transitional politics in Sudan and asked serious questions which I thought should form the basis of management of the transitional period, both at national and Government of Southern Sudan (GoSS) institutional levels. Yes, time is ticking and although impressive breakthroughs were made in the sustainability of general security in the south and at the borders, implementation of major aspects of the Comprehensive Peace Agreement (CPA), establishment of most institutions at various levels, however, some important aspects of the transition are yet to be realised and the manner in which government institutions were run has lots to be desired. In transitional situations such as the one of Sudan, what matters is that whatever political culture and institutional systems that the current leadership of the Sudan has introduced during the interim period, whether Sudan remains one or split into more entities, will have far reaching effects for the period after 2011. The current institutional frameworks in South Sudan are sometimes leveled by some as inefficient or corrupt, whether it is true or not, the reality is that to reverse the situation will require a lot of hard work. In fact, history has revealed that to be a revolutionary movement, the revolution must be translated into true revolutionary spirit by the revolutionaries, when they take over power. In most cases, the attitude of the revolutionary leadership, their supervision skills of the affairs of government, their commitment to follow up and monitor programs on daily basis to see to it that services delivery is affected in the rural areas, their dedication to the vision of their struggle, and commitment to change, are important aspects for building of any nation. When leaders are seen to have less interest in evaluating their activities and achievements, and concentrate more on obvious things such as maintaining security (of course no government can operate without security), building houses for officials among others, with less interest in visiting villages, interacting with traditional leaderships, such leadership is bound to lose sight of long term repercussions of its mandate. In fact, leadership of any society, especially a revolutionary one such as the Sudan People’s Liberation Movement (SPLM) is often judged and evaluated by the outcomes of its public work and not by the good intentions of its leadership. The SPLM has been in power for four years now and its legacy as understood by the general populace of the Sudan is that of revolutionary movement that has the mandate to fulfill its promises or objectives by delivering services in areas such as building schools, training teachers, building the capacity of its cadres, paving roads, providing clean water and sanitation, providing efficient health care, providing decent housing to its population, electrifying the rural areas, building river ports and airports, linking up the capital with states and capitals of states with counties and the counties with payams and bomas. During those years decisive decisions were expected on inter-clan or ethnic conflicts, disarmament of civilians, allegations and rumours that were spread by those who felt disadvantaged by the GoSS such as rumours on “land grabbing” in some towns, accusations of unknown uniformed soldiers and dangerous gangsters attacking citizens and their properties; complains about displaced ethnic groups refusing to return to their original areas; complains about some security organs intimidating and harassing journalists in the South, allegations of uncoordinated and sometimes parallel deployments of security, customs, civil aviation and the SPLA intelligent officers at public places, especially at the airport, and complains about jobs not being advertised in news papers by GoSS and states’ ministries and that individuals are employed through acquaintances and relatives. These allegations have had negative effects on the reputation and activities of GoSS and should have been stopped through proper channels immediately rather than being silent about them or ignoring them. Of course it would be a daunting task to expect a liberation movement turned into a ruling party to accomplish all that in four years. Nevertheless, the conventional wisdom seems to suggest that the SPLM, as the vanguard of the revolution is expected to take over all aspects of policy and decision making within the institutions of government, given that as a majority and the ruling party, its supervisory role should not be questionable. During the past four years, hundreds of articles and statements have been written and issued regarding the performances of the Government of South Sudan and its institutions, especially the role of the members of the SPLM in these institutions. One must say however, that some of these articles were defamatory, instigative and irresponsible, to say the least. From some of these evaluations and criticisms that were leveled against the Government of South Sudan and the SPLM, one gets the sense that the remaining two years are very critical and a new approach in dealing with issues pertaining to governance, financial management, institutional building and nation building in general will be vital. What went wrong and who is to blame for the shortcomings that the Government of South Sudan and SPLM were accused of and criticised for? There are five points that one should highlight to answer the above questions: the SPLM as a ruling party had vital role to play to correct things during the past four years; the Government of South Sudan should have taken time to answer some of the vital questions that its critics and some of its leaders and members have been asking; the modalities and the manner in which the census were conducted have revealed that both the SPLM and GoSS leaderships need to be careful as they work out the modalities for their participation in the upcoming general elections and the referendum during the next two years. First, the role of the SPLM in governance at different levels during the past four years at best was overshadowed by the role of the GoSS and much of what is seen as lack of delivery and accountability, especially by GoSS institutions was by necessity blamed on the SPLM because it is seen as the captain of the ship. By the nature of party politics, the role of the SPLM in governance is not vested on individuals, rather it is a collective responsibility vested on the SPLM institutional frameworks. It is true that during the struggle, the SPLM did not have strong institutional frameworks and it was only after the 1994 Chukudum Convention that attempts were made to create institutions that would be responsible for the management of the Movement’s activities. This institutionalising process was briefly, but critically interrupted during the first twelve months of the interim period when the late Chairman of the SPLM, Dr John Garang, dissolved all the institutions of the SPLM in July 2005. It took about a year for the current Chairman of the Movement to restore them as interim organs, until May 2008, when all the SPLM organs at various levels were eventually elected. Yes, the President of GoSS, his Vice, ministers and all the members of commissions, judiciary, and assemblies in the Government of National Unity (GNU), the GoSS, states, counties and payams are members of the SPLM. Being a member of the SPLM however, devoid of functional and well established institutional frameworks, would not make the SPLM as an organisation accountable or responsible for the actions of its members unless strong institutional frameworks are put in place to make members accountable. It is when the SPLM is in charge, through its institutions such as Political Bureau, National Liberation councils, Secretariats and sectoral committees that members of the Movement, who are deployed to work in government or legislative or judiciary institutions, could be accountable to the organisation. It is when the SPLM, through its institutions has the authority to call in, any time, its members in the cabinets and its leaders in the assemblies to report regularly on their activities and regularly evaluate their performances that the organisation could be regarded as being in full control. The question is: who is supposed to impose the constitutional role of the SPLM on the governments and on all other institutions? The SPLM is one of the few liberation movements in the world with highly qualified cadres, at governmental levels or outside its institutions. Little use has been made; it seems of these cadres during the past four years. Secondly, it has been argued that the Government of South Sudan, despite considerable achievements in various fields during the past four years, has been lagging behind in some critical areas. Perhaps one way to understand or to answer these criticisms lies in finding suitable answers to the following questions, most of which centre around accountability, employment and or deployment policies, resources and or financial management regulations, service delivery monitoring mechanisms, development programs and policies, operationalisation of decentralisation or federalism system and public security among others. Some of these questions include how consultations are carried out when governments are formed or reshuffles are made whether for the formation of GoNU, GoSS or states’ governments. Who consults who whenever a new government is formed and what is the role of the SPLM Political Bureau, National Liberation Council and states’ liberation councils? What are the criteria of appointments into a cabinet position or to other levels of governments? How are decisions taken within the SPLM leadership and which organs should implement them? How is the relationship between the SPLM Political Bureau/ National Liberation Council and the SPLM parliamentary caucuses being managed? How are major decisions taken in the GoSS and states’ cabinets? Who supervises the spending of the GoSS annual budget? Who supervises the spending of budgets of the states and to what extent are the funds allocated to the counties accounted for by the county commissioners? What are the channels of communication between the GoNU ministries and GoSS ministries? Who monitors the implementation of all contracts that the Government of South Sudan and states’ governments have entered into with foreign companies? What are the exact roles of the Ministry of Finance and Economic Planning and the Bank of Southern Sudan (BOSS) in the management of budgets? Who controls the national reserve of South Sudan and are there funds available for emergency situations? What is the role of the Auditor General and why is it that it is almost a year since he resigned and there is no replacement to date? It is argued by some parliamentarians that whenever the financial year ends every December 31, huge amounts are either left unspent or are transferred to the accounts of the relevant ministries at GoSS or states ministries, how are such funds spending supervised and who is responsible for making the ministries accountable for them? A sizeable number of South Sudanese have benefited from the quotas and contracts that the Ministry of Finance and other ministries have been distributing during the past four years, as means of economic empowerment of South Sudanese emerging business class and millions of US dollars have been spent on these contracts and quotas, to what extent has this important program been monitored and evaluated? During the past four years, the annual budget of the Government of South Sudan ranged between $1.3 billion US dollars and $1.7 billion US dollars, mainly from oil revenues. Since 2005, it is estimated that the Ministry of Finance and Economic Planning of the Government of National Unity has released to GoSS an amount of $6.5 billion US dollars, an amount which is meant to cover the salaries, services delivery and development expenses for the Government of South Sudan in Juba, 10 Southern states, 80 counties, about 400 payams and over 1500 bomas. To what extent has the management of these significant resources been efficient? Moreover, according to the wealth sharing protocol, the oil producing states were to be allocated 2 percent of the oil revenues, an amount which ranges between $2.5 and $4.5 million US dollars monthly, depending on the rise and fall of the oil prices. The beneficiary Southern states so far have been the Western Upper Nile and Upper Nile states since 2005 and 2006 respectively. The states of Southern Kordofan, Warrap, and Abyei administrative area’s revenues have not been clearly verified and question as to whether the central government have been keeping their percentages or it has been using them or it has given them to the states concerned needs to be answered. Do the producing counties benefit from these resources and what are the criteria for qualification for the counties to benefit in terms of development from these resources? Another question that begs for an answer is who controls these funds in the states concerned; governors, states’ cabinets or the assemblies and how is the accountability carried out, and who report to whom? On the other hand, since in 1994 when it was decided in Chukudum that the SPLM National Executive Council (the SPLM shadow cabinet) should look for sources of income to deliver services to the population in the liberated areas, levying of taxes from transit goods from the neighboring countries became a major source of income to the SPLM/A administration. Border posts were instituted, foreign companies were called in to explore minerals and exploit the timber in the Equatoria region. Taxation became a huge source of income and was regulated so that individuals do not pocket the money. In 2004, when it became clear that an agreement was on sight, the SPLM leadership invested time and resources in seeing to it that taxes at the borders are collected and by 2005, millions of Sudanese pounds were levied. Unfortunately, taxation or custom system within the Ministry of Finance was not yet operationalised in such a way that funds levied are properly deposited in banks. It has been reported that hundreds of thousands of Sudanese pounds were carried in bags from the levy stations to the Ministry of Finance, which in turn deposit them in the bank. Now that oil prices are at their lowest, it seems that the GoSS cabinet has ordered the Ministry of Finance to find ways to make sure that taxes are levied and proper channels and procedures are followed. Finding answers to the above questions would give an idea about the serious challenges that GoSS leadership had found itself in during the past four years. Certainly, it was not an easy task for an infant government like GoSS to deal with all these challenges. Thirdly, throughout the past four years, the National Congress Party (NCP) had tried to corner the SPLM in every stop sign of the CPA road map, and one of the skilful tactics it used was to go ahead preparing for the implementation of these stop signs, without committing itself to seriously negotiate with the SPLM on the modalities of the implementation of the items in question. One such important stop sign was the carrying out of a census in May 2008. The SPLM had three important reservations regarding the implementation of the census: the census coincided with the rainy season in the South, it coincided with the convening of the SPLM second National Convention and the SPLM also had reservations on omission of the ethnicity and religion items on questionnaire forms. The NCP, aware that the SPLM has in principle agreed on conducting of the census as per the CPA, went ahead and printed all the forms, formed all the committees and made sure that the census infrastructure is fully operational, while it continued to buy time engaging the SPLM. By the time that it was a few days to carry out the census throughout the country, the SPLM leadership was put in a catch twenty-two situation: if it is to boycott the census, it would be seen as acting irresponsibly because it has given its go ahead in principle, and if it is to accept it, the outcome will have the following repercussions: the census was meant to determine the exact number of South Sudanese inhabiting what is referred to in the CPA as “Southern Sudan”. 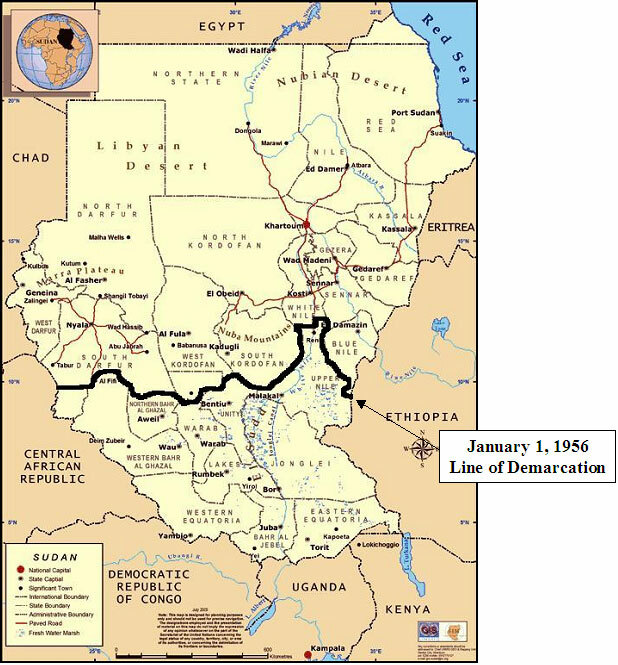 Secondly, in order for the border of the South to be determined, the population that are regarded as part of the South inhabiting those areas under the Northern army occupation must be counted, especially in Western Upper Nile, Upper Nile, Warrap and Northern Bahr El Ghazal. The only way to determine their belonging to the South would be through their ethnic background, which the NCP deliberately refused to include in the questionnaire forms. Thirdly, the population of Abyei Special Administrative Area, being a disputed area, is supposed to be counted as part of the Warrap state since the CPA has given them dual citizenship during the interim period, until such time that they decide their fate through the exercise of self-determination. Fourthly, in order for the South to determine the number of its geographical constituencies for the purpose of general elections, it is vital that the population of the South, based on the outcome of the census, must be clearly known. By registering some population of the South in the north, and by depriving them from their identity (ethnicity), it would naturally be difficult to determine the exact number of the South Sudan population and millions, such as those in the North and in the border areas, will be deprived from participating in elections and in the referendum as South Sudanese. Moreover, by counting some South Sudanese who are residing in the oil areas that are forcefully annexed to the north, the question of distribution of oil revenues becomes an issue because the CPA stipulated that only the revenues of the oil in the south will be divided, thus excluding oil revenues from the areas of the South that are forcefully annexed to the north. In other words, the consequent of not appointing highly technical and legal experts on the census committees is that the SPLM and GoSS are not sure whether to accept the results of the census or not. The choice of individuals into the committees that are dealing with the modalities of the CPA implementation has proven to be problematic for the SPLM/GoSS. Technical and negotiation committees do not need to be filled with politicians and ministers; rather by committed members of the SPLM and experts in the fields should be appointed and given guidelines to guide them as they carry out the task. The manner, in which the census process was handled, was one of the serious setbacks and shortcomings that the SPLM/GoSS would have avoided had they selected the right people to carry out that work. Fourthly, few months ago, I wrote a piece on the challenges that the SPLM might face as it prepares for elections and gave scenarios, which I thought worth contemplating about. Elections are won or lost before they are conducted, because through strategic planning and proper preparations and mobilisation, it is easier for the party to determine its chances for winning or losing. In fact, elections are not necessarily influenced by revolutionary legacies beyond four to six years. People forget easily especially if their expectations are not met on time. To win elections, a party needs high level of organisation, solid funding, viable and sophisticated media (television and radio) that would reach every citizen, especially the organised youth. The SPLM grassroots institutions need to be organised and prepared. The situation in northern sector is even worrying more, given that so far the membership that has registered has not been cross-checked or screened to determine how many have infiltrated the movement from other parties. In the South there was mass influx of members from NCP and other political parties and so far there is nothing showing that these members are genuine and committed to the SPLM vision and principles. In fact, a sizable number of the new comers occupy about 40 percent of the SPLM National Liberation Council and states’ national liberation councils. The NCP is repeating the same scenario of the census; it is going ahead preparing for elections while the SPLM leadership is playing along, without necessarily answering the difficult questions such as who will be the candidate of the SPLM for national presidency, who is the SPLM candidate for the President of South Sudan, who are the key candidates that will contest at different levels? Such a debate must start now, because the NCP is far ahead of the SPLM, because once the results of the census are announced and while the SPLM will be busy denouncing the results, the NCP will be already pushing for the date of the elections, hence creating a another de facto situation for the SPLM. The election law has been passed and the electoral committees have been formed. Next is the announcement of the date of the election. It is always relieving to pre-empt the opponents’ plans rather than react to them, because the chances are that one will make unnecessary mistakes in reaction to the opponent’s action. I was recently told a story by a young South Sudanese activist of an encounter with one of the senior SPLM officials, who was asked in a social gathering in Khartoum by young people about why every SPLM senior official when asked about whether they fully understand the tricks the NCP is using against the SPLM, their answer always is “we know”. The students were implying that they fought with the NCP inside the country for almost twenty years and studied at their schools and universities and know their thinking and ways of doing things. The senior SPLM cadre answered the young people by narrating a story: there was a young man who spent three days without sleeping. His father became restless and asked his son to tell him what was bothering him. The young man refused to tell his father the cause of his insomnia. He told his father that: “If I tell you what is bothering me, you will not sleep for a long time.” His father insisted and the young man tells him what bothers him. “I made a daughter and her mother pregnant”. His father was so upset that he spent the next few days sleepless.The SPLM senior official told the young audience that “if we in SPLM tell you what we know about the NCP, you guys will not sleep for a long time”. I do not know who was right, the students who spent about twenty years under NCP yoke or the SPLM senior officials who spent twenty one years fighting the NCP in the battle fields and in the negotiation tables. Finally, there will only be two questions for the people of South Sudan and Abyei to answer when they cast their votes in the referendum in January 2011: do they want the south to secede or to remain part of a united Sudan? However, before the people of the South decide on either option, it is very important that they answer two important questions before the end of 2009: where is the border between the north and the south and who is qualified to be regarded as a South Sudanese? Who are qualified to vote in the referendum? One of the setbacks that is supposed to have been highlighted during the past four years was the work of the National Border Commission, especially the composition of its members from the South. According to the CPA, the National Border Commission was to compose of equal numbers from the NCP and the SPLM.